Trained volunteers (docents) of all ages participate in a wide variety of duties at Columbia State Historic Park. As unpaid state employees, the docents primary goal is to interpret life in a California gold rush town during the 1850 to 1870 time period. 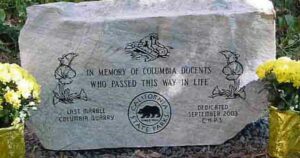 Through living history demonstrations, school group programs, guided walks, the museum information desk and a myriad of other functions, the docents of Columbia give park visitors a greater appreciation and understanding of California’s early days. Before volunteers become active docents at Columbia, they must complete an extensive and rigorous training program. 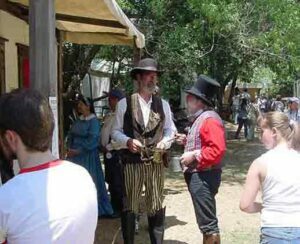 The volunteers are trained in interpretive methods, costuming, research techniques, California history, State Park policy and other topics. Docents then continue to improve their skills by attending training and performing research on an ongoing basis. One of the most popular docent functions is the school house tour. Children are taken into the historic Columbia School and given a lesson, as if they were in the 1860’s. The docent conducting this program is in costume and in character. Children learn the rules and procedures that were followed by teachers and students in historic Columbia. After this program, most children have a renewed appreciation for their own teachers. Another very popular event performed by docents is the annual Columbia Diggin’s. This re-creation of the “tent town” days of early Columbia is held in a field next to Columbia Street. It is located near the lower parking lot, across from the horse rentals. 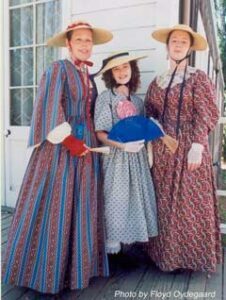 Docents in costume and character perform various “scenes” depicting life in the rough and tumble days of the early 1850’s. Early in December each year, the Friends of Columbia State Historic Park sponsors an event called The Lamplight Tour. This perennially sold out event helps fund the docent activities year round. Both paid and unpaid staff members participate in the various vignettes performed throughout the park. Without the efforts of these dedicated volunteers, the park system would be unable to provide the level of educational and interpretive activities that the public receives. We all owe these individuals a great deal of gratitude. Help park visitors gain a better understanding of the experience of gold rush miners & merchants in the years 1850-1870. We need your help providing tours & demonstrations in many of the historic buildings that are otherwise closed to the public. 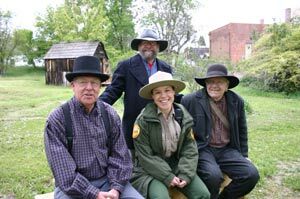 Docents are trained volunteers who assist in the educational and interpretive programs at Columbia State Historic Park by conducting school programs, staffing the museum, and participating in Special Events such as Diggins and Lamplight. Benefits include training by knowledgeable staff & guest speakers, passes to other parks, ongoing training & field trips, & the reward of bringing the past to life! Also you can download a State Parks Volunteer Application here.